Students representing the Maharaja Ranjit Singh House secured maximum points to bag the overall trophy in the 32nd Annual Inter-House Athletics Meet at Gujranwala Guru Nanak Public School here on Saturday. 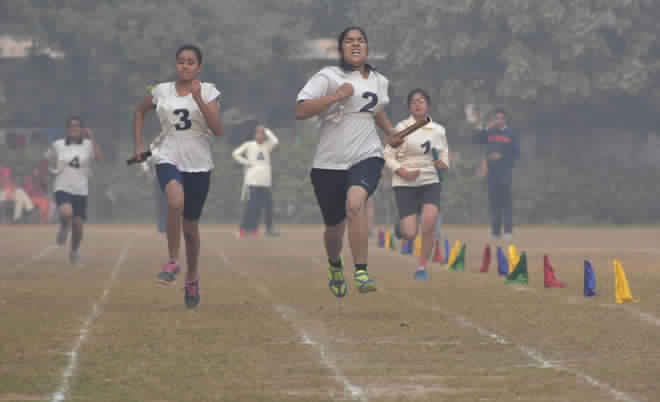 In the boys’ section (U-19), Karan Verma and Harnoor Singh were adjudged the best athletes, while in the girls’ section, Gurleen Kaur was declared the best athlete. Jaideep Singh was declared the best athlete among boys in the U-17 category whereas Jasnoor Kaur bagged the honour in the girls’ section. Similarly, in the U-14 group, Sahibjot Singh and Parneet Kaur were declared the best athletes in the boys’ and girls’ section, respectively. Balkar Singh Sandhu, Mayor, Ludhiana, was the chief guest on the occasion. Principal Gunmeet Kaur and members of the Gujranwala Khalsa Educational Council accorded warm welcome to the chief guest. Dr SP Singh, Gursharan Singh Narula, Bhagwant Singh, Kuljeet Singh and Hardeep Singh were present.